The Stars continue their homestand against the Wild this evening. They are absolutely looking for another game like they had on Wednesday night. No matter how they get there, you'd have to think six points is the only acceptable way to end this week's three games. With the level of competition that the Stars have in front of them, nothing less is acceptable. 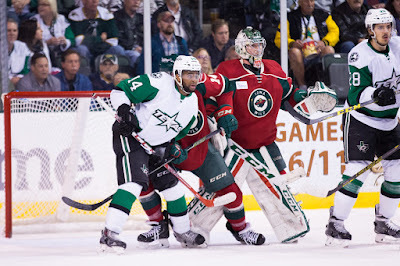 Texas is expecting to continue rolling out Maxime Lagace for both of these games. With fully five days off before the next game, why wouldn't Coach Laxdal take advantage of the success Lagace has had? Justin Dowling will be in the lineup again and with a practice yesterday to continue reintegrating Dowling into the special teams, things should be clicking even better than Wednesday (if that's possible). Iowa of course looks to play the spoiler role. Coach Laxdal points out many of these guys are still playing for jobs next season.